Olivia and Eleanor Stewart were heiresses to a large diamond mining fortune, only to be multiplied if they joined hands in marriage to the Bennett Family of Mercy Falls Calif. Eleanor's engagement to Harrison is arranged, loveless but crucial to Mr Bennet Sr's dynasty. Eleanor is killed, suppossed suicide, Olivia is not convinced. Olivia travels to Mercy Falls under the name Lady Devonworth, to get to the bottom of her sister's and her fathers untimely death. Ready to hate Harrison, and uncover his hidden secrets, Lady Devonworth spends time getting to know Harrison, only to find he isn't the man she assumed he was. Colleen Coble has always kept my attention with her character building and suspenseful plots. This book was the 3rd in the series and without having read the first 2 I was concerned that I would be 'lost'. The book can definately stand alone, but has made me intriqued to read the 2 previous ones as well. 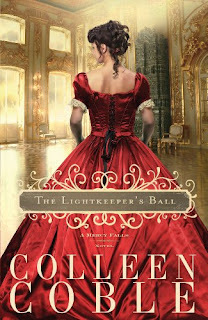 I received The Lightkeeper's Ball from booksneeze as a complimentary copy to review. Combining mystery and historic fiction Colleen Coble has created a dynamic series that will definately want to read for pleasure.